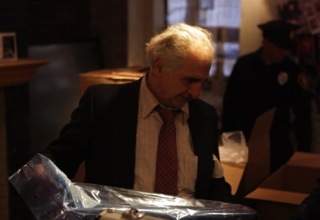 Local Staten Island actor George Morafetis can be seen in the upcoming release of PEARL. Jersey City talents Guy Patton and Dana Patton wrote the screenplay for the action-thriller film PEARL. Directed by Guy and starring Dana Patton, the film also stars Scott Michael Morales, Justin Brown, Jeff Kim. DETECTIVE JOHN WYATT (George Morafetis) A weathered veteran of the Jersey City Police Department, Detective Wyatt has seen more than his share of brutal cases over the years, yet the string of gangland homicides he is investigating feel somehow familiar. Driven to obsession, he re-examines an unsolved case from his past, and his own role in it. What he finds is that he may well be chasing a ghost. Consumed by a horrific event in her past, a woman is driven to violent retribution, and soon discovers that there can be no getting even. Her only ally: a meth-making genius who manipulates her for her own ends, while she wages a vigilante campaign against a powerful drug lord and his thug army. A detective, investigating a series of grisly homicides, begins to uncover the truth about her, and the role he himself played in her origins. But can he find her in time to stop the killing, and to save her from herself? The movie was produced by Guy and Dana Patton and John Kingman. We’ll be back to let you know the release date and details! In the meantime, remember it’s “Never. Even.”! View the trailer here!